At AAK, we know that collaboration gives rise to the best ideas. That is why we are committed to co-development with our customers. New value-adding products are developed in close partnership with you, drawing on our fats and oils expertise, customer applications and knowledge of market trends. That’s why we’re called the Co-Development Company. With cutting-edge technology and our specialty vegetable fats and oils expertise, our new state-of-the-art Innovation Center in Edison, New Jersey offers our customer partners substantial benefits. In the bakery and confection labs, we work together with you, on the same types of equipment you use daily, to co-develop innovative solutions that meet and exceed your desired product attributes. 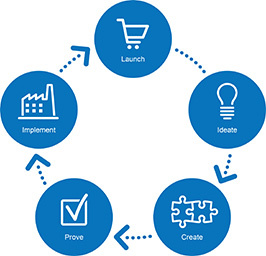 We can help expedite your product development and get you to market faster, with collaborative, highly experienced technical teams (yours and ours) working together to solve your newest challenges. The lab also houses our AAK Academies, with practical courses and new product innovation in bakery, chocolate & compound coatings, and combination of bakery, coatings & fillings. Our planet is facing many challenges—the changing climate, the increasing demand for food and the depletion of natural resources are just a few of today’s growing concerns. To remain sustainable, we have to optimize our resources and acknowledge socially responsible behavior as an obligation across our organization. To achieve sustainability and responsible growth, we need to take all of our stakeholders into consideration. We have developed a model, based on the UN Global Compact principles, to drive progress within our CSR activities, and we focus our efforts within five specific areas: Marketplace, Supply chain, Environment, Workplace and Community. We continuously set and achieve ambitious objectives within each of these areas, thanks to various internal and external performance benchmarks, our sharing of best practice principles and our highly engaged global organization. Find out more about sustainability and responsible growth at AAK. See how the industry regards AAK a leader in the journey to sustainability. AAK is a leading provider of value-adding vegetable oils & fats. Our wide range of raw materials, broad process capabilities, and expertise in oils & fats within food applications enable us to develop innovative and value-adding solutions across many industries – Chocolate & Confectionery, Bakery, Dairy, Infant Nutrition, Food Service, Personal Care, and more. AAK’s proven expertise is based on more than 140 years of experience within oils & fats. Our unique co-development approach brings our customers’ skills and know-how together with our own capabilities and mindset for lasting results. Listed on the NASDAQ OMX Stockholm and with our headquarters in Malmö, Sweden, AAK has 20 production facilities and customization plants, sales offices in more than 25 countries and more than 3,000 employees. We are AAK – The Co-Development Company.